The Federation of Saint Kitts, correctly known as St. Christopher, and Nevis are located at 17ᵒ20′N, 62ᵒ49′W. Saint Kitts covers 65mi²/168km² and Nevis 35mi²/93km², the latter dominated by a single dormant volcano (Nevis Peak). The highest point in Saint Kitts is also a dormant volcano - Mount Liamuiga (formerly Mt. Misery) rising to 3,792ft/1,156m. The two islands are separated by a narrow 2mi/3km shallow channel; but during the last ice age, both islands, and the nearby Sint Eustacius, were all one piece of land! Saint Kitts was originally known as St. Christopher Island, thanks to Columbus sailing by in 1493, but in pre-European times, it was called Liamuiga – meaning ‘fertile ground’. Nevis was known as Oualie (Land of Beautiful Waters) by the Caribs and Dulcina (Sweet Island) by the early British settlers. The name, Nevis, is derived from the Spanish, Nuestra Señora de las Nieves (Our Lady of the Snows). Fun things to do in Saint Kitts – try the unique narrow gauge St. Kitts Scenic Railway, a 30 mile 3 ½ hour circle tour of the island, swim with the dolphins, dive, sky dive, zipline, watch Batik being made, hike through (dormant!) 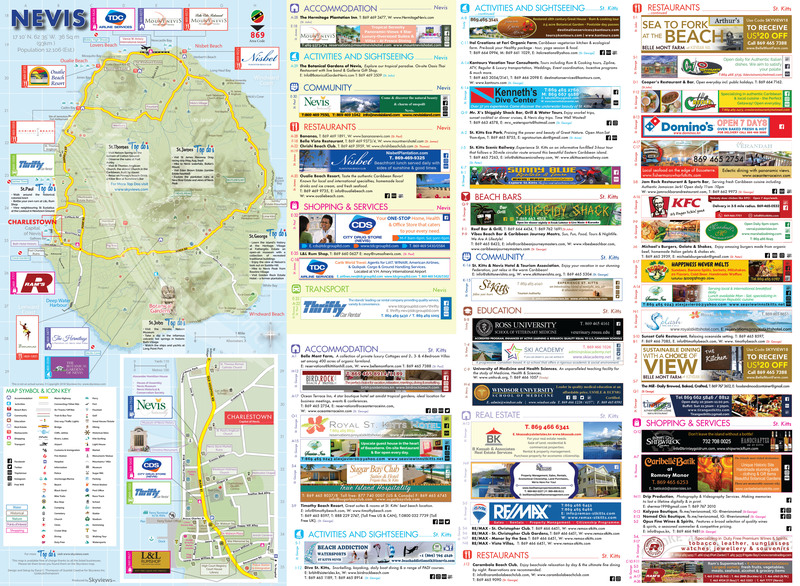 volcanic craters, visit historical sites, and much more! Nevis is your destination if you fancy a dip in hot mineral springs. 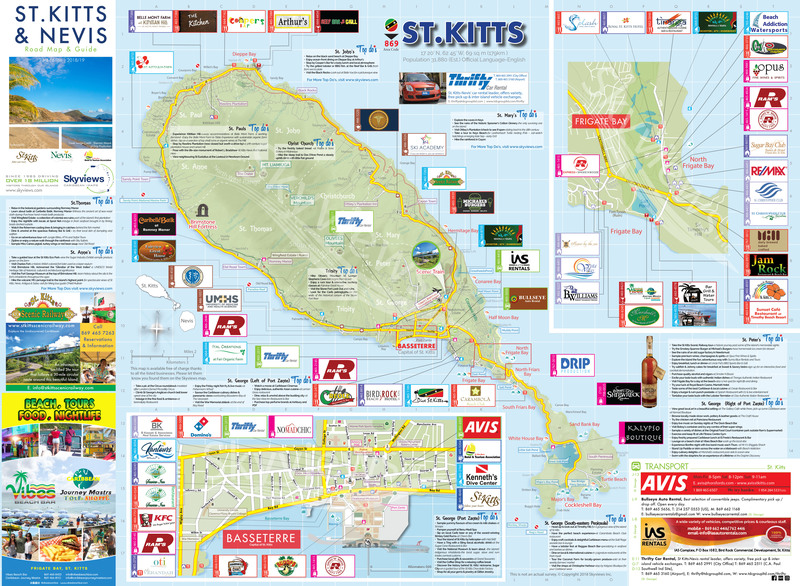 View our full list for Top Things to do in St. Kitts and Nevis. Going to St. Kitts & Nevis and wondering where to stay, what to do, where to eat and how to get around? We’ve got you covered with our list of hotels, restaurants, activities, car hire, shopping & more. Browse through for more details. A key date in the St. Kitts Calendar which brings genres of music and generations of fans together in a summer event that is distinctive in the Caribbean. Rising local talents are showcased alongside international stars for three consecutive nights of exhilarating performances. Culturama is the equivalent to the carnival celebrations held on many other Caribbean islands, though it is historically tied to the abolition of slavery on Nevis in terms of the date it is celebrated. Public Holiday The day was first made a holiday to honour Robert Bradshaw, the only official national hero at the time, and Bradshaw’s birthday is the reason for the holiday’s date. In 2004, Paul Southwell was named a national hero. He was the second premier and a strong promoter of trade unions. In 2013, the list of national heroes grew to four with the addition of Simeon Daniel, a well-known politician and the first premier over the island of Nevis. Public Holiday The holiday looks back to the day in 1983 when the islands gained self-rule from Britain, becoming the smallest independent nation in the Western Hemisphere. Around 100BC the island was inhabited by the agricultural Saladoid people. Around 800AD they were replaced by the Igneri’s, members of the Arawak group. The fierce Caribs (or Kalinago) arrived around 1300 forcing everyone off the island and naming it Liamuiga. Christopher Columbus did not stop off at the island he named after his patron saint, but the English landed in 1624 with an intent to stay. Not to be outdone, the French arrived a year later and between them both, killed off all the Caribs at Bloody Point in 1626. The English took over Nevis some two years later. As per usual for these islands, a tussle ensued for dominance over the next 100 years. Sugar was king and both Saint Kitts and Nevis produced impressive good quality cane and rum due to slave labour. The Treaty of Paris, signed in 1783, finally ceded both islands to Britain. Slavery was abolished in 1807. Even for its small size, Nevis is resplendent with history. Amongst many notable names is the young Admiral Horatio Nelson, who fell in love with and married Frances Nisbett; and a founding father of the United States, Alexander Hamilton was born and spent his childhood on the island. His home now houses the Museum of Nevis history. On September 19, 1983 Saint Kitts and Nevis was granted independence from Britain. The twin island Federation remains a member of The Commonwealth.